In vitro culture of primary or established cell lines is one of the leading techniques in many areas of basic biological research. The use of pure or highly enriched cultures of specific cell types obtained from different tissues and genetics backgrounds has greatly contributed to our current understanding of normal and pathological cellular processes. Cells in culture are easily propagated generating an almost endless source of material for experimentation. Besides, they can be manipulated to achieve gene silencing, gene overexpression and genome editing turning possible the dissection of specific gene functions and signaling pathways. 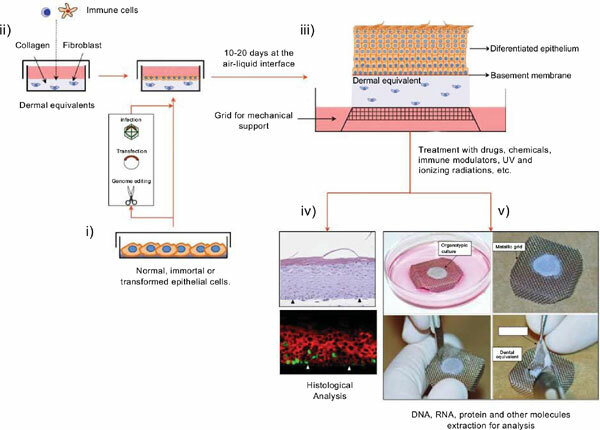 However, monolayer and suspension cultures of cells do not reproduce the cell type diversity, cell-cell contacts, cell-matrix interactions and differentiation pathways typical of the three-dimensional environment of tissues and organs from where they were originated. Therefore, different experimental animal models have been developed and applied to address these and other complex issues in vivo. However, these systems are costly and time consuming. Most importantly the use of animals in scientific research poses moral and ethical concerns facing a steadily increasing opposition from different sectors of the society. Therefore, there is an urgent need for the development of alternative in vitro experimental models that accurately reproduce the events observed in vivo to reduce the use of animals. Organotypic cultures combine the flexibility of traditional culture systems with the possibility of culturing different cell types in a 3D environment that reproduces both the structure and the physiology of the parental organ. Here we present a summarized description of the use of epithelial organotypic for the study of skin physiology, human papillomavirus biology and associated tumorigenesis. Keywords: Epithelial organotypic cultures, Rafts, HPV, HPV-mediated carcinogenesis, virus. Keywords:Epithelial organotypic cultures, Rafts, HPV, HPV-mediated carcinogenesis, virus. Abstract:In vitro culture of primary or established cell lines is one of the leading techniques in many areas of basic biological research. The use of pure or highly enriched cultures of specific cell types obtained from different tissues and genetics backgrounds has greatly contributed to our current understanding of normal and pathological cellular processes. Cells in culture are easily propagated generating an almost endless source of material for experimentation. Besides, they can be manipulated to achieve gene silencing, gene overexpression and genome editing turning possible the dissection of specific gene functions and signaling pathways. However, monolayer and suspension cultures of cells do not reproduce the cell type diversity, cell-cell contacts, cell-matrix interactions and differentiation pathways typical of the three-dimensional environment of tissues and organs from where they were originated. Therefore, different experimental animal models have been developed and applied to address these and other complex issues in vivo. However, these systems are costly and time consuming. Most importantly the use of animals in scientific research poses moral and ethical concerns facing a steadily increasing opposition from different sectors of the society. Therefore, there is an urgent need for the development of alternative in vitro experimental models that accurately reproduce the events observed in vivo to reduce the use of animals. Organotypic cultures combine the flexibility of traditional culture systems with the possibility of culturing different cell types in a 3D environment that reproduces both the structure and the physiology of the parental organ. Here we present a summarized description of the use of epithelial organotypic for the study of skin physiology, human papillomavirus biology and associated tumorigenesis.